LIVERMORE, Calif. (KGO) -- Police are investigating a fatal shooting at the Livermore Arcade Shopping Center on First Street. 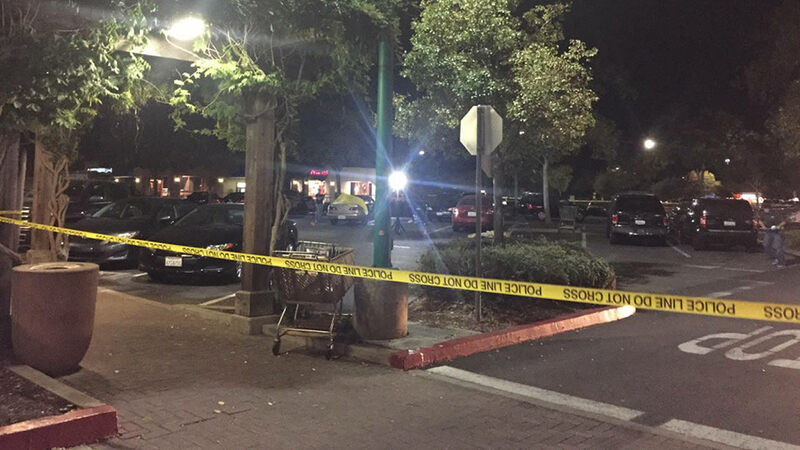 Police tell ABC7 News that two people were shot inside of a vehicle in the parking lot of the busy shopping center anchored by a Safeway grocery store. One deceased, one injured. Two suspects with assault rifle on the loose last seen in Oakland. Witnesses at the scene provided a possible suspect and suspect vehicle description. The first suspect is described as a black male with a tall, thin build. He was wearing a gray beanie cap. This suspect was armed with a black long gun. The second suspect was only described as a male. They are considered armed and dangerous. The vehicle the suspects drove off in a black 2006 BMW 325i with a California license plate number 5PLR682. The car has two red racing stripes on the hood. The suspects fled out the parking lot onto Railroad Avenue. CHP located the vehicle on I-580 and initiated a pursuit, but lost the vehicle in Oakland.